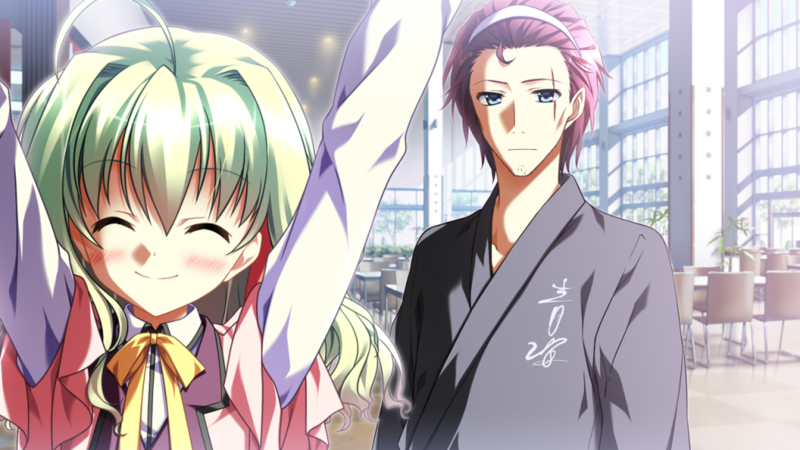 Today’s Tester’s Corner for Supipara – Chapter 1 is brought to you by Nurio! Boom, baby! I’m back! After an experience that I ranked “just slightly less traumatic than a purple Unicorn gaining her wings” I took a break for a year or so. It stands to reason. But I’m back at full force now! Hooray! To celebrate, have an extra-long Tester’s Corner with lots of pretty images! For those who are new and don’t know me… Hi, I’m Nurio. I think I’m possibly the most senior beta tester at this point? (Though I’m not that old; I promise!) It stands to reason, since I’ve been with the company for a long time now. My Tester’s Corners can be a bit zany, so please bear with me as we go through my experience with Supipara! And don’t worry; I tried to keep this one tame for the newcomers. It stands to reason that I start with what most people will see when they boot up this game: This game is absolutely gorgeous. And I mean it. It’s gorgeous like that one hot cousin you can only look at, but can’t touch. 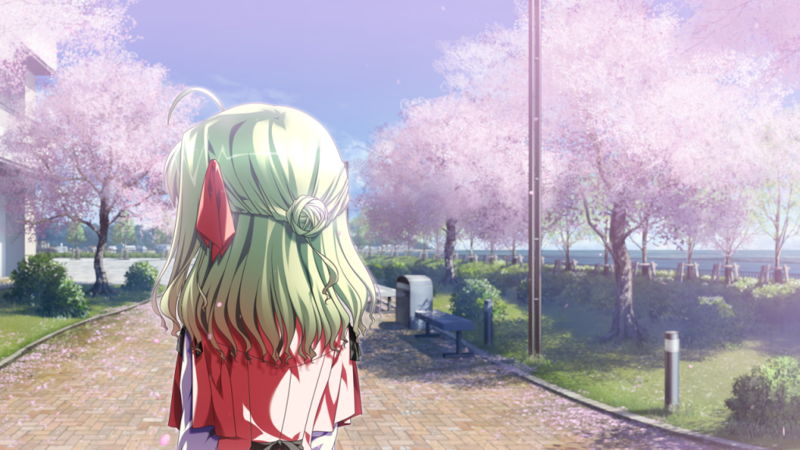 The game starts with a scene in a cherry tree forest at night, and cherry blossoms flutter across the screen, and soothing music starts playing, and you hear a cute voice, and it’s all animated, and… and… Mmh! If this game were a dessert, I’d have finished it and gobbled it up right then and there. Luckily this game isn’t a dessert, and we have some good hours of gorgeous fun ahead! Ah?! Onee-chan!? Back! Back to your cage! I don’t want another embarrassing display! 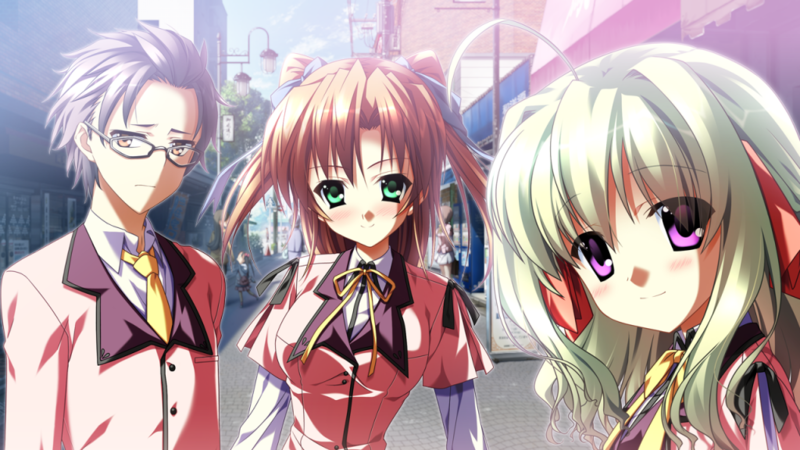 Now, it stands to reason to say this visual novel has huge production values. They sure didn’t cut any budgets on the animations, anyway! The intro video shows a fluid, dynamic (not to be confused with fluid dynamics) anime sequence that demonstrates what happens when you text and drive fly. (You’ll see what I mean.) And all throughout the game they use a huge variety of sprites to the point I don’t know if some scenes are Event CG or just a normal background + sprite combination. 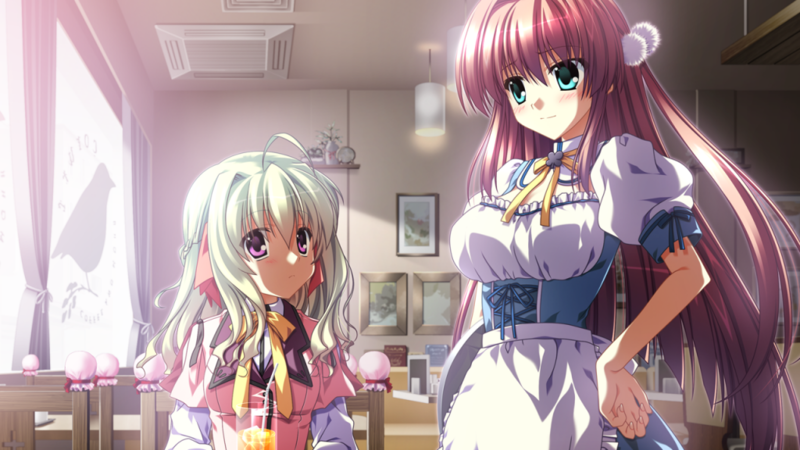 Luckily, MangaGamer didn’t hold a pop quiz on “identify the Event CG” or I’d fail. And Nurio doesn’t like failure! I mean, look at this! Is this event CG or just sprites on a background? You’ll find many scenes like that, where they drop down drop-dead gorgeous backdrops without stop, with cropped props on top the backdrops with a hop, skip and a jump♪. Err, what was I saying again? Right. Sorry, I lost myself a bit there, fading off into a song about hopping, skipping and jumping. It only stands to reason. I think I’ll take this moment to talk a bit about the sound design instead of the graphic design. It stands to reason that they’re both very important, and it seems the designers also understood as much. The tunes you hear throughout the game are all very good, with quite a few emotional pieces alongside happy, bouncy pieces. If anything, it made me nostalgic for the time in my youth I was playing a puzzle game with such ace music, I listened to it for hours on end every single day for over a year! It was a very, very happy time in my life, and nobody can ever take that cherished memory from me anymore. 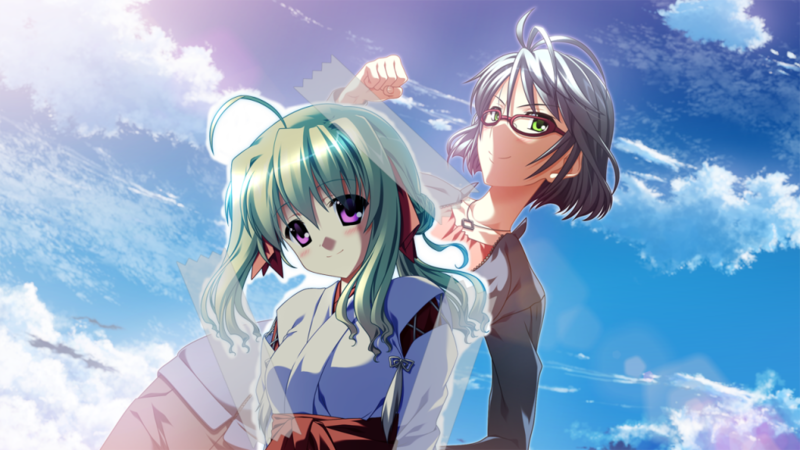 The music had a side effect of making me imagine I’m solving puzzles while talking to Momiji in this visual novel, though. Mmmh. Momiji. Uhm… Oh, yes, music. I was talking about music. 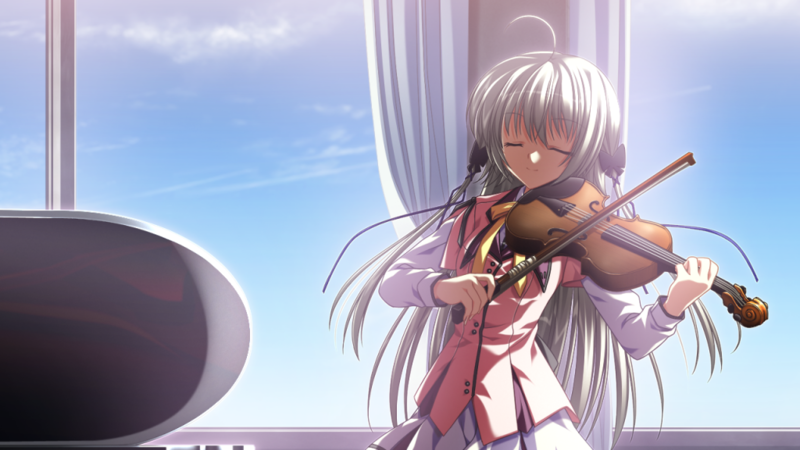 What stood out to me is that this visual novel has a violin piece! I freaking love the violin! 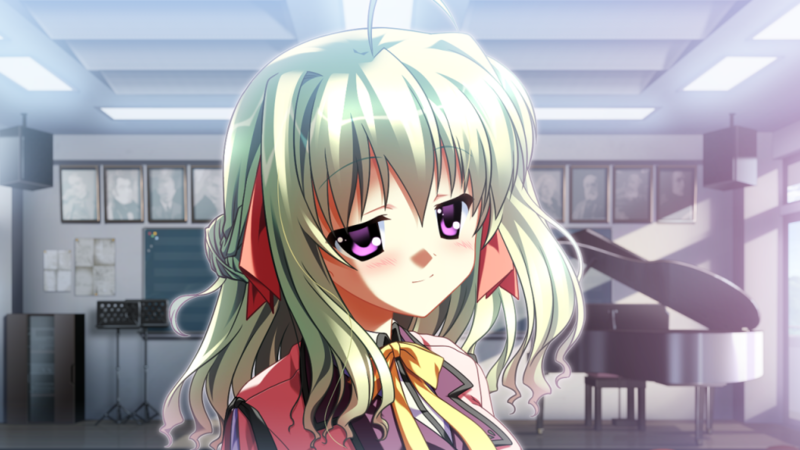 If they ever make a visual novel with violins for characters, I’ll play it in a heartbeat! Bonus points if it has H scenes! But, such a visual novel doesn’t exist, so I’ll have to make do with pigeons for characters instead, which is naturally the closest equivalent to a violin. All characters, aside from the protagonist, are voiced, which is pretty standard fare, I think. All characters’ voices really fit, and the performance made me have strong feelings for almost all characters, whether good or bad, so they definitely did a great job voicing all those Desu~. What’s especially nice is that the voices are in stereo. 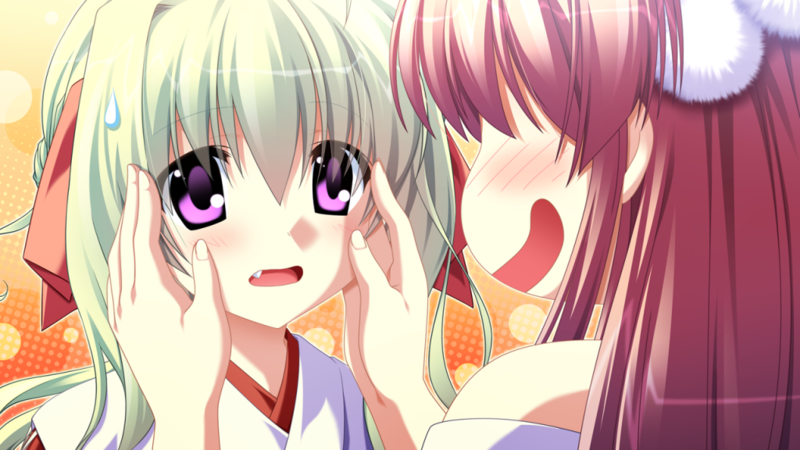 So if Momiji is softly whispering in your left ear, you actually do hear it in your left ear (if you have headphones (and they’re plugged in (into your computer (and it’s turned on (and you’re playing this visual novel))))). I had no real place I could put this beautiful collage, so it ended up here. 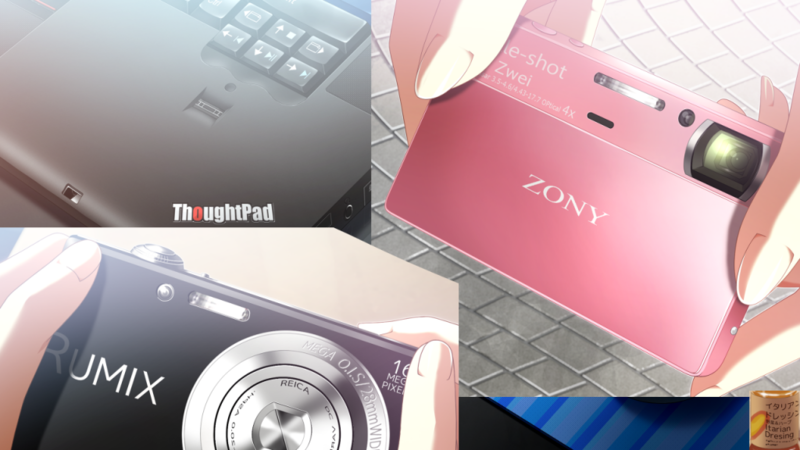 I always like those fake brands and Engrish in anime and such. So, going back to the graphical design talk, characters have a huge variety of sprites, all of them animated with blinking eyes and moving mouths. The variety of the sprites extends to the point where you have front-facing, semi-front-facing, side-facing, back-not-really-facing, and back-not-at-all-facing sprites. And then those all have a variety of how they have their head turned. And on top of that, there’s the variety of poses. And the variety of outfits. And the variety of expressions. AND the variety in lighting. AND ALSO the variety in zoom levels. Gah, so much variety! The math tells me that it has like 49 variety whereas the usual visual novel has like 9 variety. Trust me, I’m a mathematician and those are proper units. It stands to reason. Can you then understand why I sometimes have trouble knowing if a scene is a special Event CG or just a background with one of the 49 million variety of sprites? Can you understand the struggle of not knowing whether something is Event CG or not!? I’m talking important things here! Ahem. If you could decode that message above, you’ll have noticed this game has sprites where the characters have their backs turned to you. Now, I don’t know about you, but I am usually very hurt when a girl turns her back to me. After all, it only stands to reason. Momiji-chan, please don’t turn your back on me… I love you~! Luckily, it stands to reason that they always turn back around to face you again. And after such a harsh moment of neglect, you can only be ecstatic when a girl looks you in the eye again. Especially when they’re all such cuties! 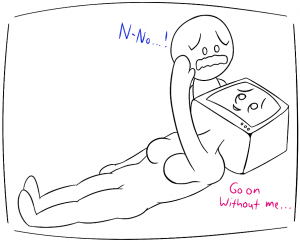 …I-I’m not the lonely basement-dweller kind who only finds love in virtual girls, okay? My real, physical, non-virtual mom still loves me every day! Hmph! Yes, Momiji-chan. Turn around and look at me with those animoo eyes~! Not pictured: Momiji. Or Yukinari. 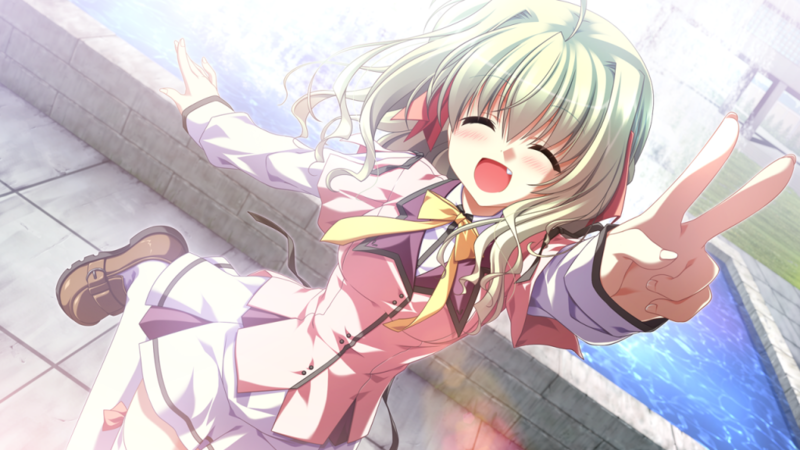 Let’s start with the protagonist, Yukinari Sanada. It stands to reason that I don’t tell you too many details, but because of certain situations, Yukinari was passed on from relative to relative like a beach ball for most of his teenage life. He’s a highly adaptive, slightly sarcastic, mightily honest, lightly toasted protagonist. When he was young, before becoming a human beach ball, he spent his life in Kamakura and the story begins with him returning to his hometown. At some point, he meets Momiji. This is an important event. Because it’s Momiji. 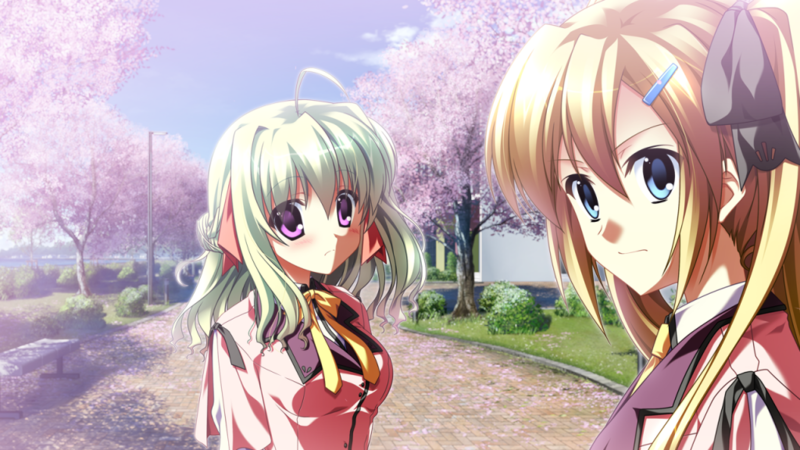 Higashino and Nishizono, pictured here with Momiji, are an inseparable duo. In fact, they’re called the East-West Duo since their last names mean East and West respectively, or something. I don’t actually speak Japanese. (Go figure! It only stands to reason.) Everybody calls them by their last name; in fact, I think you’ll only hear their first name once, so… I kinda… Ahem, anyway! They’re the token semi-generic male and female classmate, but that doesn’t mean they’ve got flat personalities or flat chests. (Well, I guess one of them has a somewhat flat chest.) In fact, they’re just as much a part of the plot as the other characters! But Momiji stands above all! Kamikawa, pictured here with Momiji, is a bit more of a background character. He’s the chef at the school cafeteria and he has various nicknames due to his notoriety. (I mean, have you seen that scar? It stands to reason!) But he’s actually very compassionate and kind-hearted. If you hate this guy, then, well… then… you’re wrong, okay!? Everybody likes this guy! 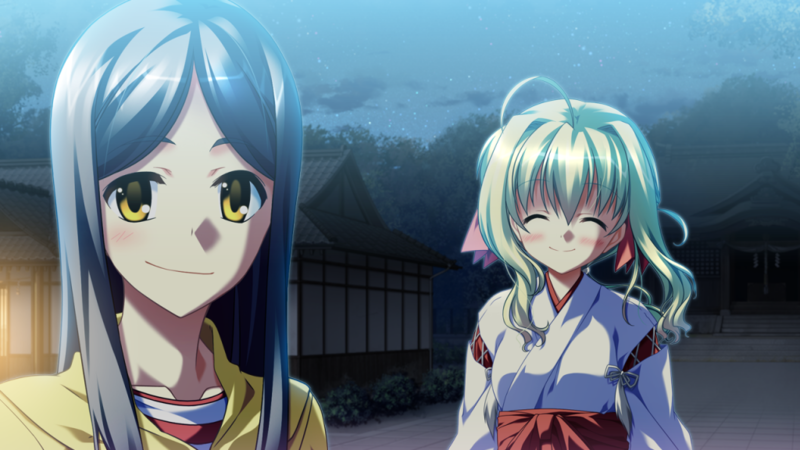 Look at how happy Momiji is when she’s near this guy! 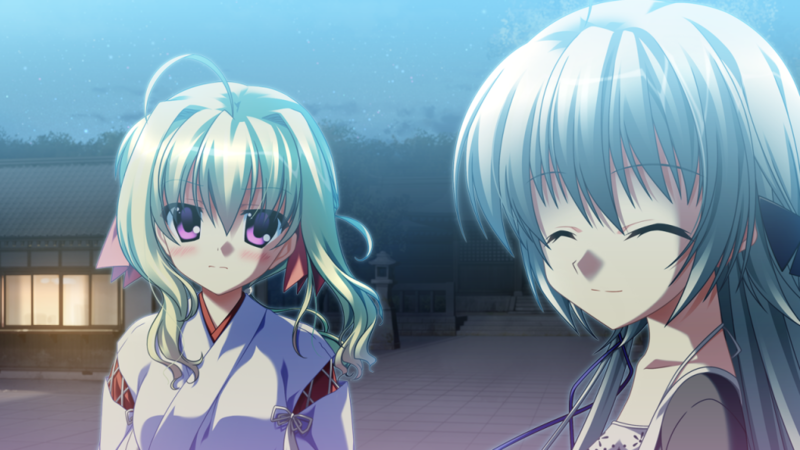 Kyouko, obviously pictured and not taped-together here with Momiji, is another background-ish character. She’s a movie director who mostly only knows hard work, spirit and gusto. Uhm, I think that’s all. I don’t really like glasses characters. Sorry. It stands to reason, though. Oh! One more thing! 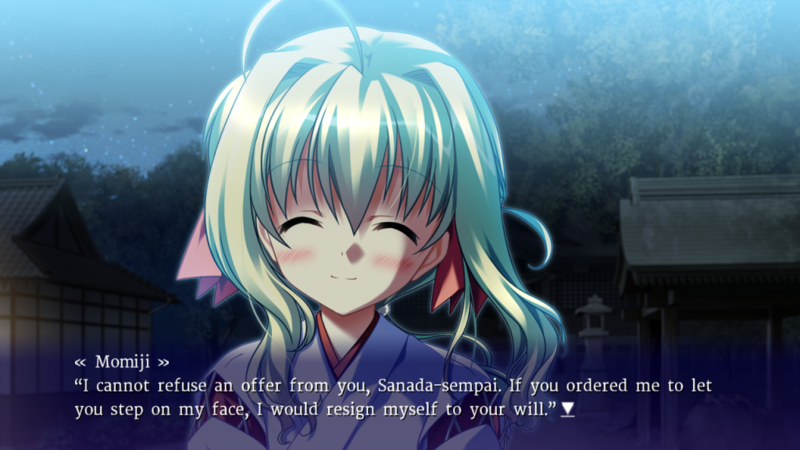 She committed the cardinal sin of never ever meeting Momiji in this visual novel! Bad Kyouko Nakase! Bad! Go sit in the corner! 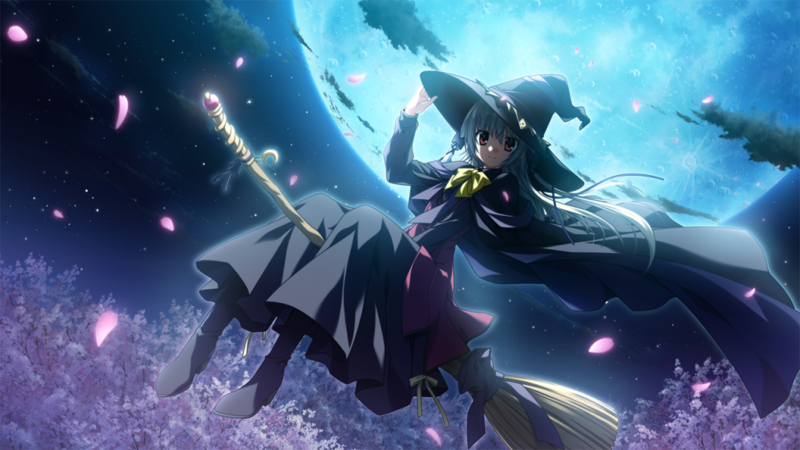 Last, but certainly, definitely, absolutely not least, there’s Momiji Yuuzuki. She’s the very best a spirit maiden at the local shrine and she has both a calm, proper, dignified side and a happy, bubbly, playful, energetic side. She puts the fun into functional, whatever that may mean, and her masochistic streaks will turn even the most pacifistic Buddhists into straight-up sadists. I could go on and on about her, but this Tester’s Corner is about the whole cast of characters, not just about Momiji. Duh. It stands to reason I tried to include her as much as possible, though! She was the favorite character for 4 out of 5 people involved, but I called dibs! Hnn… I-I’m not obsessed with her, okay?! Speaking of drama, this game is so graphically advanced, my poor, old computer had a little trouble with the cherry blossom animations (and only those). 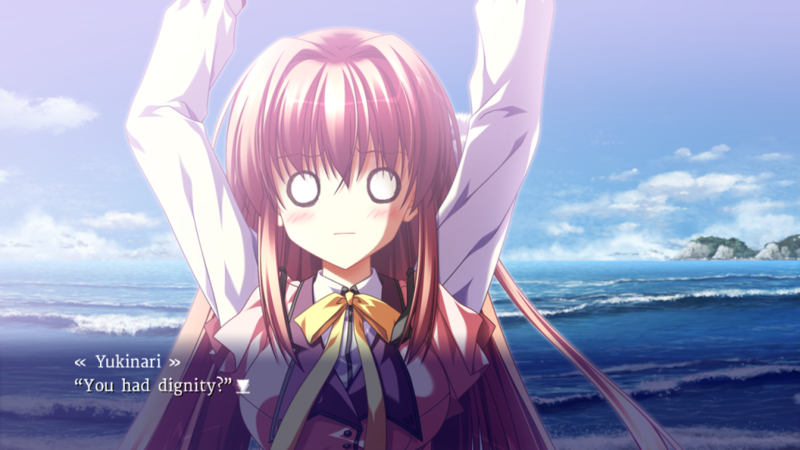 It made the framerate dip, though not to the point that the visual novel was rendered unplayable. (I mean, it’s a VN, not an FPS. It stands to reason you can still play it just fine.) But my poor, old computer felt like she was dying. So I held her in my arms and soothed her to an eternal sleep. It was very sad. Man, I’m such a good artist, that drawing is about indistinguishable from all the other masterpiece CG in this Tester’s Corner. It stands to reason if you can’t even see a difference! Anyway, it was very traumatic. So, please respect Minako. RIP, sweetie. Lastly, some of you may be wondering, why does Nurio keep on saying “It stands to reason”? And all I can say to that is… It stands to reason! Supipara Chapter 1 will be out this Friday! Pick it up directly from us right now or on Steam later this week! « Funbag Fantasy Now Available for Pre-Order! I’m not privy to any insider information, but I doubt the next chapter will take as long. What does “secret counter” count? You are stripping me of my power here! So why are so many of the images in your old blog posts 404’s, Nurio? But I have to clarify one thing——Momiji is mine.